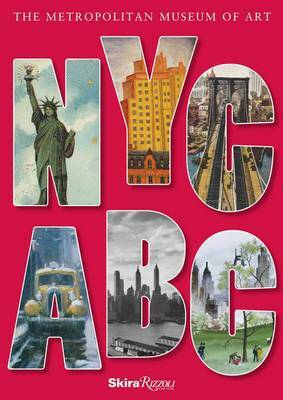 In this charming New York City souvenir gift book, children learn the alphabet and the city through the art in one of the world's greatest museums. From "Avenue" to "Zeppelin," this deluxe alphabet book looks at New York City through the eyes of artists whose works are in the collection of The Metropolitan Museum of Art, New York. Each letter features multiple colorful images of places or experiences in the world's greatest city. For example, see the Brooklyn Bridge in a Walker Evans photograph or a nineteenth-century print. Harlem is brought to life in artworks by Romare Bearden and Jacob Lawrence and a quilt by Faith Ringgold. The delightful variety of images range from an ephemeral vintage postcard depicting the magnificent Statue of Liberty to Edward Steichen's renowned photograph of the Flatiron building. In all, over seventy-five paintings, prints, textiles, postcards, and photographs show Gotham as never seen before by a range of artists, including Childe Hassam, Georgia O'Keeffe, Edward Hopper, Alfred Stieglitz, Fairfield Porter, and John Sloan. There is a simple, colorful spread devoted to each letter of the alphabet, and the book includes a checklist with thumbnail illustrations and identifying captions for all the artworks.